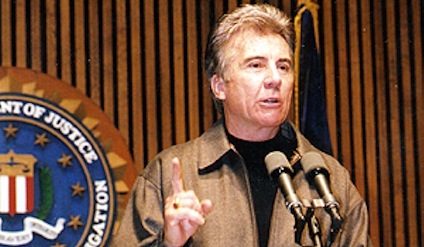 AMW host John Walsh in photo from show's website. Lifetime has thrown a lifeline to America's Most Wanted, which Fox earlier dropped as a weekly series because it supposedly was losing money for the network. AMW and its charter host, John Walsh, will return for a 25th season on an unspecified date "later this year," the network announced Tuesday. Fox also will retain some ties to the show with quarterly two-hour specials, the first of which will air on Oct. 29th, AMW says on its official website. Lifetime president and general manager Nancy Dubuc praised AMW as a "seminal program that provides a very valuable service to both viewers and law enforcement agencies." And Walsh said, "We are back in the game and ready to saddle up for another season to get justice for victims and put dangerous criminals behind bars." A Lifetime publicity release also says that AMW has "played a major role in the capture of more than 1,100 fugitives in the U.S. and 30 countries" since its 1988 launch on Fox, where it became a Saturday night staple in tandem with COPS. ***Facing the financial realities of acclaimed but expensive dramas such as Mad Men and Breaking Bad, the AMC network is joining the more cost-efficent "reality" game in hopes of balancing its checkbook. The network has green-lighted Kevin Smith's Secret Stash, an unscripted ode to the comic book culture, and JJK Security, which will highlight a firm in rural Georgia. Both are due sometime next year. AMC also is splitting its most-watched scripted series, The Walking Dead, into a two-pronged Season 2. It returns on Oct. 16th with a 90-minute episode, with five more new hours to follow. Dead then goes dark until Feb. 12th, when a second run of six episodes is scheduled. ***TNT has canceled Jada Pinkett Smith's medical drama, HawthoRNe, after three seasons. The series co-starred singer/actor Marc Anthony, whose marriage to Jennifer Lopez also is being canceled. "Hey everyone . . . if you don't know HawthoRNe will not be returning for another season, I want to say thank you to all," Pinkett Smith said on her Twitter page.